Yesterday, Dave B. and I ventured to Anahuac NWR for a little photography. We arrived about sunrise looking for the elusive "Bobcat" that everyone seems to find and photograph. After a trip around Shoveler Pond we drove toward Frozen Point, turned around and we were headed back. It seemed that we had struck out again, and then. We noticed some Turkey & Black Vultures and Crested Caracara perched on the fence and some on the ground. I knew immediately that it meant breakfast. The vultures suddenly flushed and that's when we saw mr. wiley coyote sneaking through the tall grass. He came at the birds with teeth showing. I had parked my truck so David and I could capture some of this. The coyote, normally very shy and difficult to photograph, seemed not to mind us parked there as he ate some of the wild hog's carcass. We didn't find the Bobcat but Coyote was a great substitute. Super shot of this guy, taking over the kill! Personally I love coyotes, although I know some people feel just the opposite. I remember watching one creep up on a mass of Snow Geese at Bosque del Apache. It was too far away to get photos, but was fun to watch through binoculars. Ferocious and fierce looking! 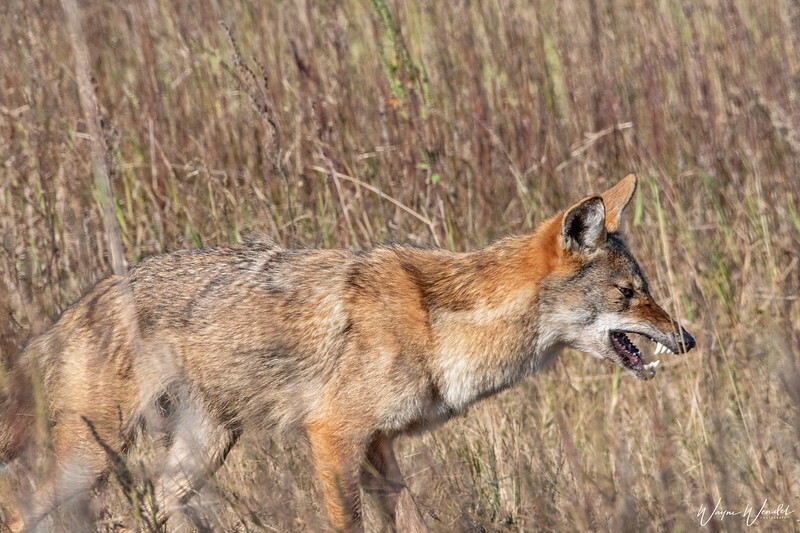 I have a fear of coyotes ever since being told how they "sneak up on people." We are beginning to have a bit of a coyote problem where I live. Although we are "sort of" in the country, there are so many new houses going up around us that people are having issues with the coyotes getting their chickens and small pets, particularly cats. Nevertheless this is a great capture and it has a super story to go with it. Well done. Terrific capture...what a treat for you all!